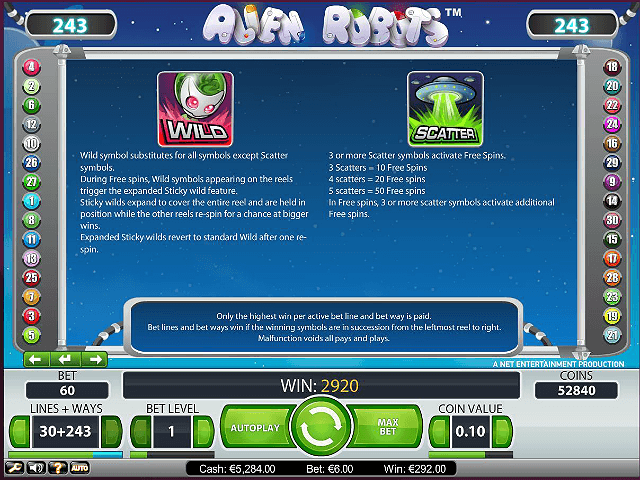 The Alien Robots slot machine is a five-reel slot from the future, where cute, cartoon-style robots from outer space descend to Earth. Given its graphical prowess, it comes as no surprise that Alien Robots’ software provider is NetEnt. 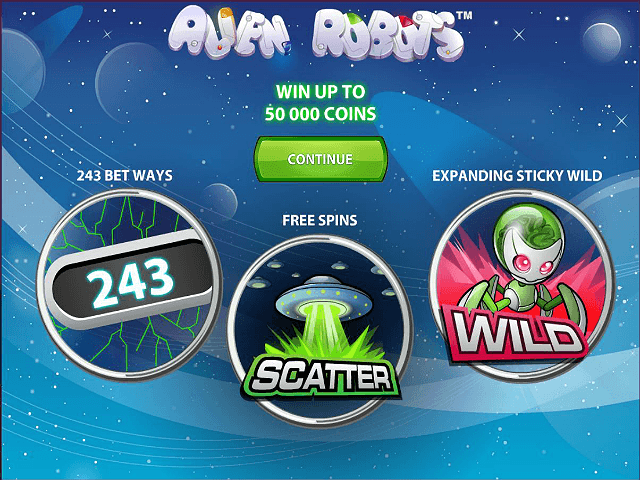 Scan our Alien Robots slot review and see if the game is optimised for your playing pleasure! 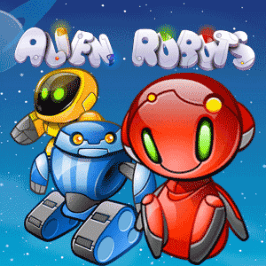 Play Alien Robots for Real Money! Software provider NetEnt has taken inspiration for Alien Robots from the metal heads that capture our hearts in movies and TV shows such as WALL-E, Doctor Who and Star Wars. It comes with electronic beeps and buzzers as the robots communicate with one another, as if the game stepped right out of R2-D2’s brain. Striking a winning payline sends out a shockwave of synth, animating the characters with the alien robots dancing, and the robotic dog wagging its tail, happy that it's won you money. Thankfully the graphics of this video slot aren't robotic or jerky, offering smooth, bright animations, with the alien robots springing to life if you manage to link them up for a win. While it might seem simple compared to other NetEnt slots, it's great fun and comes with an appealing return-to-player rate of 96.6%. 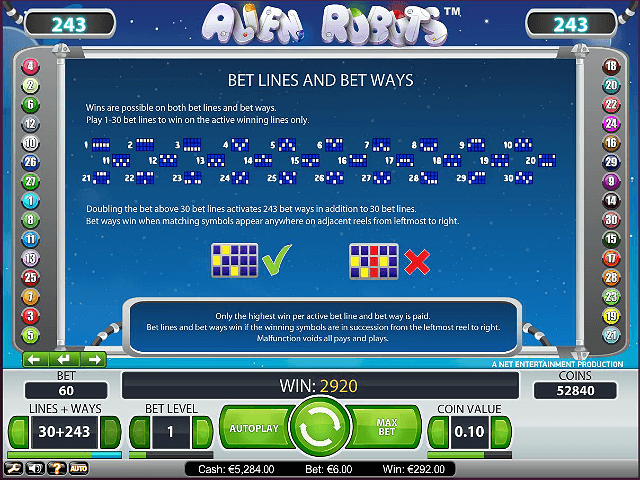 The Alien Robots slot offers two ways to play, and the payout tables make it easy to understand both. The first is the standard paylines, with the game offering 30 over its five reels. However, high rollers can also activate the 243 ways to play mode, doubling any bets made. Choosing this means that there are more expanding wilds and scatter symbols, while the slot game play means the rules on paylines are torn up, and symbols are matched left to right, regardless if they're on a line or not. The Alien Robots slot game features classic card characters 10, J, Q, K, and A as its base symbols, all rendered in a colourful, pixelated font. 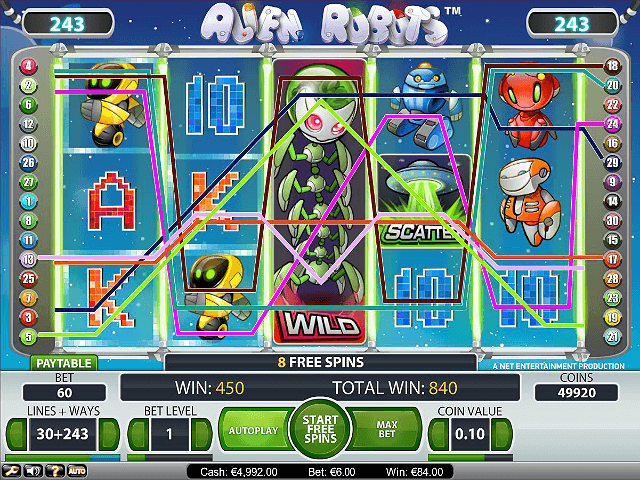 The higher-scoring slot game symbols are the Alien Robots, whose colours are coordinated to match the succession of the card symbols, with blue as the lowest, followed by green, yellow and orange, with red as the highest. Lining up five red robots will score an epic 10,000x the original bet on the paylines, or 1,500x on 243 ways to play. The scatter symbol is the UFO firing its beam, and three or more are required to activate the free spins, with five granting 50 free spins. If you land more scatters during the free spins round, these will be added to your existing free spins for even more fun. During the free spins, you'll want to keep your eyes peeled for the wild symbol, an evil-looking, green insectoid robot with glowing red eyes. Despite its appearance, this robot will be your new best friend, as it becomes an expanding sticky character when in the free spins mode. If you're lucky enough to capture one, it will expand to cover the entire reel, and remain bolted in position while the other reels spin again, increasing the odds of winning while playing the Alien Robots slot machine. Share this Alien Robots Review today! If you like Alien Robots, you'll love these slot titles too!